FIRE OF THE DRAGON ~ one whiff of that sulfur breath and he’s going to know exactly what you are. Book Blurb: Being sent back in time to the Middle Ages wouldn’t be so bad if the knight in shining armor who comes to your rescue didn’t swoop down in the form of a fire-breathing dragon. Unfortunately for Jill Donahue, that’s just the way things have been going in her life lately. A Dragon Baelin of Gosforth is a valiant knight who has been cursed by a vindictive witch to live as a dragon for eleven months out of each year. Now he has thirty days to break the curse or he turns back into a fire-breathing beast and, as much as he hates to admit it, he needs Jill’s help to do it. And A Curse Forced to face many challenges along the way—from the harsh world they travel through to the fiery passion they both try to deny—each is determined to break the curse so the other can get their happily-ever-after. And it just might work, if Jill can manage to overlook the fire-breathing, bat-winged remnants of Baelin’s dragon half long enough to see the man beneath the beast and get the job done. Here’s what I thought: Think I Love Lucy meets DragonSlayer with a dash of Beauty and the Beast thrown in for good measure. A hodge-podge, for sure. And, it works. 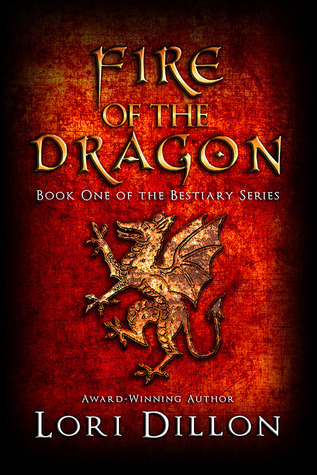 FIRE OF THE DRAGON is charming and funny and utterly captivating story. It is the first story in Lori Dillon’s Bestiary Series–definitely a series to watch. Jill Donahue is a 21st century woman thrown into the past via a magic tapestry and lands smack dab in the middle of a medieval village about to be sacrificed to real, live, fire-breathing dragon. Her antics often reminded me of I Love Lucy moments and at times her thoughts and verbal responses were similar to what I would think or say, if I stepped in her shoes. I love it when I can really identify with a character. Makes the story much more livable and exciting. Of course, Baelin is absolutely scrumptious. A true knight–chivalrous, loyal, and his plight gripped my heart. Only able to take his human form one month out of every year until he finds a maiden to break the curse, he’s starving for companionship that he believes he’s too vile to experience. Jill and Baelin embark on a quest to find the three challenges that Jill must complete for the curse to be broken. When the adventure begins, Jill and Baelin have their own agenda. Jill wants to return home, in the 21st century; Baelin simply wants to be totally human all the time. As they journey together, they begin a dance of friendship that becomes a waltz to so much more. Learning more about each other, their motives become less egocentric and more self-sacrificing. It’s a beautiful process, but it isn’t an easy road. They face personal trials, some of which they fail, and then have to overcome the mistakes they made to repair and rebuild their budding relationship. I loved how Jill was a damsel-in-distress who wasn’t. Yeah, she was sacrificed to a dragon and really wasn’t much good at freeing herself, but when Baelin is able to show her his human form and explain his circumstances, she doesn’t shy away from the challenge of breaking the curse. Nor does she need convincing. She sees beyond his beastly form to the wounded soul of the man and she sets out to rescue him. Neither have a clue what the three challenges are that Jill must face, so they sort of bungle along, forging a true bond as they learn to trust one another. A story set in the Middle Ages could get a bit heavy, you know with all that medieval mind-set that stomped all over women’s rights; but the author uses Jill’s 21st century humor to lighten the tone. There are quite a few outrageous laugh-out-loud moments. One of my favorites is when Jill experiences that time of the month and makes the off-handed comment, “My kingdom for a tampon!” Some readers might find that off-putting; I, however, found it rip-roaringly funny in the context of what was happening in the story. Not to mention an irreverent toss out to Shakespeare’s RICHARD III. If you’re a fan of A Connecticut Yankee in King Arthur’s Court type of stories, I think you’ll enjoy FIRE OF THE DRAGON. Oh, be warned. It does contain an orgasmic aerial love scene. Baelin, after all, is a dragon. Blush Quotient: Magenta (in between pink and red) While not overly sexually explicit, Baelin isn’t entirely human when he and Jill make love. SG rating: 5 I didn’t want to stop reading and seriously contemplated calling in sick to the day job so I could finish it. Author Scoop: In a previous life, Lori worked as a graphic designer for fourteen years for the power company, occasionally venturing into nuclear power plants for her job (yes, nuclear plants need graphic designers, too). In her current existence, she weaves tales of the past, the present, and some places only magic can take you. Lori lives in Virginia with her engineering geek/hero husband, two kids who test her sanity on a daily basis, a dog named Hokie (named after the Virginia Tech Hokies, of course), and various other critters of the furred and finned variety. She loves to hear from her readers. Please send her an e-mail at lori@loridillon.com. I’m tickled that you find my reviews helpful in growing your TBR pile. More books = more exciting adventures. I’m always game for those. Oh – if only my TBR list was a mire pile! Thank goodness for e-readers so there is room for me. Otherwise my TBR mountain would take over. 😉 Thank you for sharing! This sounds like a fun, exciting “adventure” that I have added to said mountain. I must go read now! Sounds fun! Thanks for the great review, Kristal. Sounds like fun! I’ll have to add it to the TBR list. Great review! Also like that it’s set in the Middle Ages…haven’t run across that period much lately. Must add to my TBR.